Follow our Adventure ... Enjoy the Journey! The Send-Off: No race is complete without the proper send-off... and leave it to the crazy OKC 99s to do just that! Monday night found Theresa in the midst of a wild send-off party, fitting for Team Wild Mama, and complete with a send-off cake, wild hats and Wild Mama & Nuts cookies. I wish I could have been there with you all but know that I was there in spirit. Thanks to a fantastic group of ladies. We will carry your strengths and enthuiasm with us through-out the race and make Oklahoma proud of its home child. June 18: X14 - KHSD: Our journey began this morning with a quiet departure from LaBelle into the glorious southwest Florida skies. We are very fortunate in Florida as the morning are normally cool and clear and the air is smooth. Only rarely do we see the thunderous skies that we see in the mid afternoons ... except today. Although we departed to sunshine and VFR conditions, it was not long before we air filed IFR to get around the huge storm that had blown up just north of Brookville, FL. We ended with a 50 degree westward deviation to run the gauntlet of clouds and avoid the worst of the build-ups with little more than a trickle of rain hitting the plane. Dodged the bullet. The remainder of the trip to Quitman, MS was uneventful, except for having to guess where the Quitman, Clark County Airport was hidden. Tucked in and among the trees, it was just plainly not visible from our angle; but we knew it was there as a cheery Linda greeted us on the radio and ushered us in for some really great fuel at only $4.15/gallon. Sad to say that is cheap now-a-days; but Linda even sweetened the bargain with her winning personality and southern hospitality. 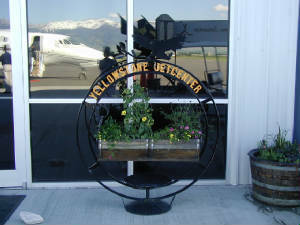 They just opened a new FBO building there - very nice - with the Grand Opening next week. We departed Quitman after a quick 20 minute turn around and pressed on toward the west. We crossed the Mississippi River and kept thinking about the folks up river where all the flooding occurred. It was truly amazing how there were still some areas in Mississippi that looks like they still have drought conditions while up river, the water had broken levies and created such a mess. We passed the FEMA trailer storage lot at M13 airport. It caught our attention because of the recent news story about all the excess that was purchased but never used for Katrina victims. We saw excess on top of excess on the airport grounds with thousands of trailers stuffed in every spare corner. We pressed on. The large storm that had blown over OKC this morning opened a path for us and we flew right through, past the ammunition depot near McAlister, OK, through some dissapating cloud cover and right in to Sundance just NW of OKC. The 2 #1's who have been separated now for months, like long lost twins, are back together again. We are ecstatic to see each other and excited about the adventure that lies ahead. We finish our plans, cookies and packing and reorganizing the plane. The plan is to rest tonight, yeah, right! I am sure we will be like usual - up half the night chatting up a storm. It is good to be back hanging out again with my other #1! We Made It! : OK, so you have the punch line first and the end will not be a surprise .... but the part in the middle is not so shabby. Theresa and I awoke early this morning; checked the weather and made out our plan ... and I should know better by now not to use that word in the same sentence as "airplane" as I am creating a recipe for disaster. 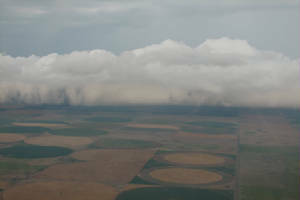 We filed IFR as there were scattered 20% thinderstorms along the route. So what could be the chances of hitting ALL 20%? Hmmmm... We were to depart Sundance at 0800 local, scoot through to Torrington, WY for a fuel stop and then fly the mountain passes over Yellowstone and on in to Bozeman. That was the plan. 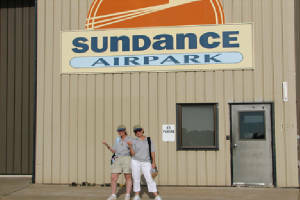 Upon arrival at Sundance, we saw no one. The doors to the hanger that sheltered Wild Mama were locked; the burglar alarm was wildly chiming as we had tripped it upon our entry and there was no one to be found. Apparently, for the first time in history, the FBO keeper overslept--must have been the cookies we left him last night. By 0915, we finally got on our way wheels up and northwest bound for Torrington. The MX20 and the Garmin 496 come to life with a beautiful mosaic of colors and lightening bolds dead in our path. We call ATC for deviation of 40 degrees - we get "up to 20". Well, that put us squarely in the heavy to intense precipitation zone. We press on, ever so slightly nudging the heading bug farther to the west, then southwest to skirt the storm by a healthy distance. She was a beaut: the kind you read about in the AOPA "Never Again" chronicles .... if the pilot lives to tell the tale. Our deviation lasted nearly 70 niles and over 30 minutes until we finally came back around. In all, we had started at a 315 heading and diverted to a 240 heading before we could finally turn northward to get to our destination. With the worst behind us (I just lied), we plotted a new course for Torrington. We heard another race team, Classic 14, picking their way through the corridors which opened up in that "other 80%" zone of clear. Fuzzy math. 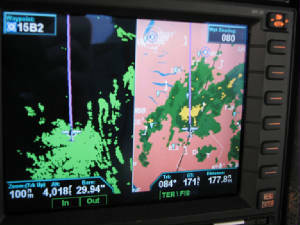 We gave PIREPS: "Light precip; but otherwise VFR." We passed under a cloud that was building heavily off the left wing; but far enough off that it gave us no cause for worry. Wild Mama suddenly went wild. WHAM! We hit the ceiling of the plane. The violent turbulance shook us to the core: coats and hats went flying, our cookies got tossed and the back seat, Vern included, looked like a freshly tossed salad. She bucked, pitched and rolled for only a minute or so; but so hard that it was difficult to grab the throttle to pull back to manuvering speed. Then came the down drafts. The autopilot held her altitude but we were rapidly losing airspeed and she was nosing up way too much. We kicked off the auto pilot and nosed her over to gain some much needed airspeed until the downdraft subsided. What excitement. I looked at the flight timer - 2 1/2 hours. Hey ..... I just crossed my 1000th logged flight hour .... apparently with a bang! I hope we see Torrington soon. It was a relief to land. That last leg seemed particularly hard fought with the turbulance and constant vigilence for the boiling clouds that seemed to intrude on our little 20% path for the majority of the journey. We fueled, rested a bit, checked the weather and went to (here's that word again) plan B. The mountain meander was out. The winds were wildly variable - both in direction and speed - and that 20% scattering of thunderstorms .... well, we are back to the fuzzy math again. New route: Crazy Woman VOR (appropriate), Sheridan, Billings then Bozeman. We took off. Plan C.
Crazy Woman and Sheridan were stormed over so we diverted to Gillette to go around the build-ups. Guess what follows? We put down in Gillette with a black cloud looming in our path to the northeast. Theresa naps; Verns plays helicopter; I pace the floors and watch the howling winds and driving rains as they pass the field. The weather service says "hail". Please do not ding my baby. We dodged the bullet. Finally after an hour or so layover, we can depart to 25 knot wind racing down the runway. We go VFR into a semi cloudless Montana blue sky. The air smooths; the rains are finally held at bay, pestering some other poor, unfortunate pilot. We see the majesty of the mountain ranges peek from beheath the clouds. The snow capped peaks (in June???) were spectacular and the calm air that now enveloped us made the trip worthwhile. It was truly beautiful. Our arrival into Bozeman was, by comparison, uneventful. A normal approach into the valley below the giants. We land. We are exhausted. Poor Wild Mama went from "Classic 11" to "Classic 1/2" as most of her numbers were flown off during the days journey. Quite a few other racers are already here. Party time! NOT! Dinner was welcomed at this point - but so is the shower and bed. Tomorrow will be another day. Theresa and I are ready to collapse into bed. We will face the world anew tomorrow. Wild Mama needed her inspection today but not before being re-numbered and getting her oil changed. We decided to head out to the airport early and were greeted with the grand views of the mountains that surround the Bozeman valley. The air was cool and crisp and the winds were calm. There was quite a bit of aviation activity about: not just commercial traffic but an enormous amout of general aviation traffic...and so many really cool airplanes - open cockpit bi-planes, gliders, vintage aircraft and a wide variety of jets, turbo-props and other toys. It was such a thrill to be part of such an awesome setting. There was plenty of race hustle and bustle as well. Many more racers were arriving, registering and doing all sorts of airplane preparations. We met lots of friends from last year and also lots of our new friends who will be racing for the first time. A small group of racers gathered at a local restaurant, Famous Daves BBQ, where the conversation was brisk as the morning air and a bit wild and racey like the pilots themselves! With the inspection behind us, we really got the chance just to relax a bit to re-group. We spoke with the locals about flying around this area and about the beautiful the views. Tonight we will relax and study the race route a bit now that we have few resurrected brain cells. Big, Beautiful Sky: For the race, the main focus of the morning was a pilot/co-pilot credentials check. We showed up early and were whisked through in a manner of minutes. OK, now what? Nothing scheduled until the Girl Scouts Greeting at 2 p.m. and the "Meet the Racers" BBQ at 5 p.m. We decided an extracurricular excursion was in order up to Big Sky, MT ski and resort area. 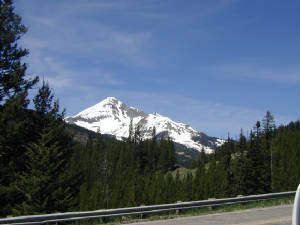 The drive to Big Sky was very scenic: green meadows, towering pines and raging rivers. With the melting snow and heavy rains, the rivers have been quite swollen and the white water rafters were certainly getting their money's worth. Our day's excitement was going to be much more mild .... even with Ann Marie and Julieann with us (we figured they were enough!). 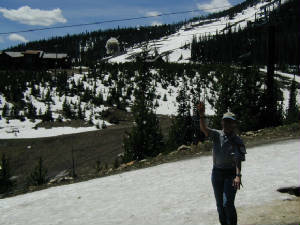 We continued on up the mountain to Lone Peak and Moonlight Lodge to have lunch. The views were nothing short of spectacular, the Reuben Sandwich that Theresa and I shared was one of the best ever, and the day was filled with airplane stories and lots of chatter and laughter. 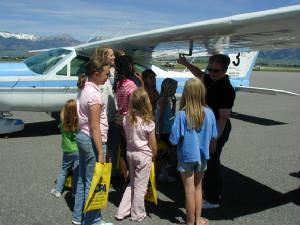 Upon arrival back at the airport, we were greeting by 20 or so young girls scouts, eager to learn all about airplanes and aviation. We chatted with the girls; they toured some airplanes, participated with Denise in a mock airport demonstration so the girls would learn the function of ATC, and made very creative paper airplanes. With the airplane activities winding down we migrated to the "Meet the Racers BBQ" hosted by the local Montana Pilots Association where we met all our compatriots and shared more stories and laughter. Members of MPA had worked from the wee hours of the morning roasting a whole pig for us, which was served with all sorts of good food and drinks--a real Montana welcome. The Mayor of Bozeman, Kaaren Jacobson, joined us to complete the warm welcome. Kaaren, yet another very accomplished and friendly female, was thrilled to learn about our all female organization and event. I think we may have inspired a future woman pilot! We grazed and visited until we were all so exhausted that we had no option other than to try to retire for the night. Take-Off Banquet: For a day that was scheduled to be slow, we sure were busy. Part of the busy was in getting some needed down-time and rest; part was strategy planning and the other part was required meetings and briefings. Theresa tried to rest a bit this morning but ended up checking weather forecasts for the route. Vern and I met with Denise to review ARC Board stuff over breakfast. There were a few airplanes left to inspect or re-inspect; and some last minute paperwork needed to be finished. Vern dashed off to the airport to meet racers, accompany a few to planes and guide the remaining through inspection. 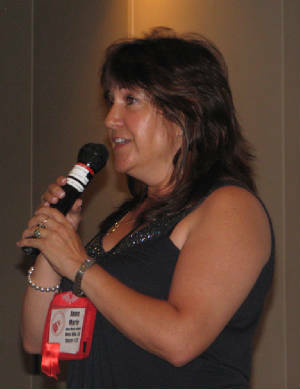 The first time racers briefing was the main afternoon event. This is a required meeting for all first time racers and is meant to be an overview of the things to come. Theresa, as a "baby bird", was required to be there as a first time racer, and I (a "mama bird") was training to give future first time briefings, so my attendance was mandated as well. It was, actually, a good refresher of things to expect and jostled my memory of things that I had forgotten and other things that I had failed to consider last year during the race (my first year). We have nearly 30 first time racers this year - about one half of the field; so it should be quite interesting to see who the "sleepers" turn out to be. Our evening ended with fly-by reviews, weather watching, race planning and strategizing. Although we have been preparing for the race over the last several several months, finally seeing the terrain ahead of us, looking at the actual weather patterns ahead of us, and bringing it all together, we still have so much more to do before take-off Tuesday morning. One cannot truly appreciate the added planning that must go in to complete a SPECIFIC route over a short SPECIFIC 4 day period. We finally succeeded in retiring early (11:30 p.m. local time) - both of us playing the song in our heads. Long Briefings: Today was the briefing day - safety, weather, fly-bys, departure procedures and more. Although it was only supposed to last from 8-noon, we did not escape until nearly 2 p.m. By that time, we were fried and still had a pile of stuff to do before the end of the day. We dashed off to the airport to snap Wild Mama from the hanger and to pack her and get her ready for the next day ahead. There were many "Board related" last minute issues that kept Terry busy but we both succeeded in getting to bed early (before 11 p.m.) Maybe we cn finally get some rest. Ladies - Start Your Engines: After our final briefing and take-off breakfast, we headed en masse to the airport to make our final preparations, load our planes and blast off for our racing adventure. 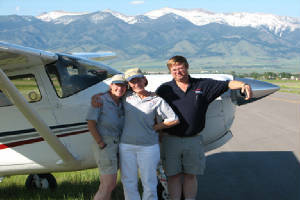 Team Members, Mike and Vern, along with friend, Jim, and Theresa's son, Mark, came for our send-off in Bozeman. The planes, all lined up, taxied out to runway 12 and took off one by one. We took-off, wheels up at 0840 local time and headed for the "M" (our mountain side flightpath landmark). We rounded the first set of mountains and kept climbing for the best winds and to clear the last set of peaks in our path. We had a great leg and worked well together. We got our special tail winds, promised by our weather briefer, Alan Pratt, as a present for my birthday. The leg passed fast and before we knew it, we were headed for the fly-by at Miles City. 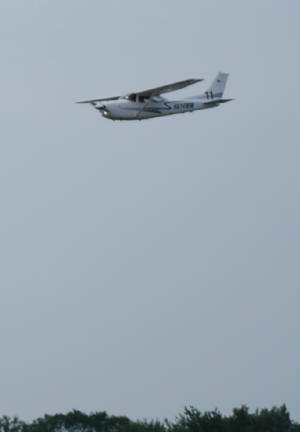 As we had such a great tailwind, we were able to make the fly-by to continue and head on to Aberdeen, SD. The leg was filled with the many sights of this wonderful country that we have come to enjoy from the vantage point of Wild Mama. We passed the Bad Lands, many windmill farms, farm houses dotting plowed fields and the ever changing tapestry of the earth. Our stop in Aberdeen was a bit longer than we had anticipated. Although we wanted to make Decatur, IL by night fall, there was a thunderstorm in our path. The weather was a bit of a concern for the whole trip through, so we opted to go as far as Mason City, IA. Our debate was for a departure now or to wait until morning. With the thunderstorms pressing toward Aberdeen, we did not want to get caught. Like the 2007 race, we opted to take the hit on the winds to avoid the marginal VFR weather forecast for the entire route from Aberdeen to Mason City tomorrow. With Classics 12, 21, 22, 7 and "The Pig" (we love you Martha and Deb) behind us, we headed off into the afternoon haze. As predicted, it was s slow leg, but not nearly as slow as we had anticipated. We captured the updrafts from the clouds overhead that picked up our tail and gave us periodic bursts of speed. Mason City was a welcome site. Ready for our fly-by to land. 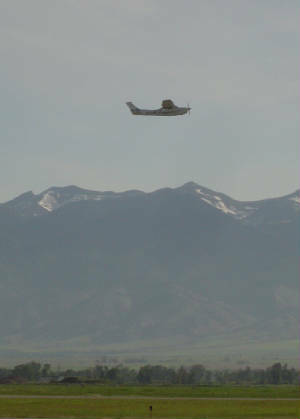 A small corporate jet radioed that he was about 8 minutes out when we were setting up for our fly-by. Theresa jumped on the radio and, ever so politely, suggested that he hold his landing as we were making the fly-by for our timing run in less than 5 minutes. We flew the timing line and turned for our downwind. Our jet friend politely went around the pattern to allow us to go ahead of him and end our racing day. We are followed in by the Carastros (the Mother/Daughter team); Ann Marie and Julieann and later on we are joined by first time racers, Karen and Judy (Classic 6) and Martha and Deb with "The Pig", their Navion. In celebration of a great first day, good friends and lots of fun, not to mention my birthday, we feasted on chicken salads, chocolate cake and ice cream. Tonight, we rest happy and ready for tomorrows' adventure. 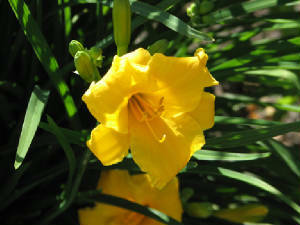 Wait & Hurry up: Well, our gamble with the front and the weather apparently did not pay off. The front we had banked on to build dissipated and the one we had hoped would break up, held tough. . . so we sat... and sat... and sat. It was nearly 1 p.m. local time before we finally departed. The planes left in waves: some left early; others held out a bit then a large final wave finally launched. We were in the beginning of that final waive. We departed behind Classic 21, another 182 RG. She climbed and we initially stayed low. We drifted apart in our paths then "Traffic!" Betty alerted. We drifted back together and she was only 300 feet above and immediately on top of us. We called: "Racer at marker 165 - do not move--we are 300' below. We will hold altitude." Clasic 21 responded and we artfully drifted apart with nothing more than a sigh of relief between us. TCAD just earned her keep! By the time we drifted apart, we were unable to climb to catch the favorable winds aloft so we stayed down lower under the cloud deck where the winds were not as favorable. It was quite a busy leg as we passed through 3 controlled air spaces. 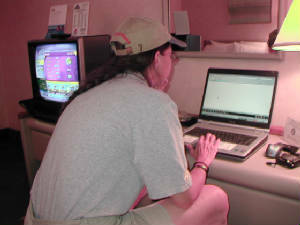 Theresa was busy on the radio and I was hard at it looking for traffic and responding to ATC commands. We all ended up zooming into Decatur at the same time. The tower operator was busier than I have EVER heard a tower and he handled all of the racers for fly-by, taxiing instructions and the landing and departing traffic in a most professional manner. Hats off to the Decatur Tower!!! Hope you got some of the cookies we left. Our stay in Decatur was all too short. We grabbed some fast fruit, water, fuel, did a weather check and then were on our way to get to Frankfurt, KY by the end of the day. We would have liked to go farther today, but it was not to be so. We made our departure from Decatur with a diving drive to the timing line at 187 kts ground speed, pulled up and began our climb. We settled in for a nice, easy more comfortable leg. We came screaming in to Frankfurt with Classic 2 hot on our tails, made our fly-by and peeled off for a cool down and to let Classic 2 do a fly-by on RWY 6 as winds favored RWY 24 for landing. As we taxied off for the night the planes were coming in fast and furious. As this fly-by was at 200' AGL, the sounds and sights of the planes roaring past the timing line were quite a site. With Wild Mama safely tucked in, we opted for a hotel a bit out of the way for some work, strategizing and most of all, much needed rest. We are hoping to make it all the way to Mansfield tomorrow, but we do not know. If we have another "wait & hurry up day" like today, we will find ourselves with one day remaining and miles to go before we sleep. Race Day 3 - June 26th - Wait & Hurry up ... Part 2: We awake early to try to make our final sprint for this race only to see another storm - probably remnants of the one that we had to wait for yesterday - directly in our path. Looks like another wait and hurry up day as of the first look at 5 a.m. Keep your eyes on Spot today to see. We finally got to make the break for Franklin from Frankfort after the large storm passed by our path. The ceilings remained fairly low but the low winds were favorable so that was fine by us. The scenery had a dramatic change from the flat lands and pastures to rolling hills and it was nice to be low enough to enjoy them. We had a good leg but some bad luck caught us as we called for flight following through the MOA and they diverted us nearly 20 miles around it - blew our score for the day; but that was OK as it was still a good day. With a little dive and tails winds we came screaming across the timing line for landing at nearly 185 kts. Click! We were pleased. We land and see that the weather on the other end in Saratoga Springs is IFR, so we decide to get some much needed lunch at the airport Italian restaurant. It was such a pleasure to be able to sit with our fellow racers and friends and enjoy a leisurely meal without inhaling it whole as we had done on our quick stops. Then, we engaged in our favorite game for the race .... wait and wait, check the weather again, and ... wait. That was it. By 5 p.m. we decided we had had enough and called it quits. The ceiling was improving but we did not want to take the risk to go. Four racers blasted off and probably made it just fine, unlike the others of the afternoon who had to put down somewhere off route due to low visibility - below VFR minimums. We are safe; we are happy; we get to the hotel before dark for a change. As our fellow racer, Martha, said: If you race to win, you have fun some of the time; if you race to have fun, you win all of the time. Today we are winners, even though we are a bit frustrated that we could could fly no farther today. Tomorrow we have our last 2 legs and (weather permitting) we should have no problem getting into Mansfiled. So far, so good and we are ready now to race for the finish! We Finished the Race! The morning was a big rush to get out of the hotel and to get to the airport as the weather forecast deteriorating conditions by the afternoon. We had many thunderstorms last night that had discipated by morning but left Wild Mama stuck in a hole requiring us to get a tug to pull her out. She was soaked. We knew time was of the essence this morning. We were efficient. Weather review - check .... coffee and donuts - check .... airplane all ready - che...... (phone rings) .... OK, time to go! We fire up Wild Mama for the last dash across northern Pennsylvania, New York and on to Mansfield, MA. Classic 10 departs ahead of us. We call for departure, climb to 2500' and make the dive bombing run for the timing line. I notice a beautiful contrail streaming off the wing. Wow - lots of rain water left over. We hit the timing line over 195 kts. The timer calls our time and comments on the contrail .... noting that it has the distinct look of fuel. OH NO! The fuel cap! I forgot to tighten the fuel cap and finish my preflight after I got the phone call. "Classic 11, returning to land for fuel issues. Can the fuel truck stand by? We are on the clock!" The whole ordeal cost us 13 gallons of fuel and over 12 minutes and we now had to climb out at normal cruise as we did not get to build the momentum from the flyby. This is going to be a long leg. The ceilings were VFR but still low. We could not climb over 4,100' without bumping our heads in the clouds. Some teams found holes and got on top only to discover no hole on the other end to come down. We stayed low sandwiched at a respectable distance between the mountains and the clouds. It was a very busy run; we had a tail wind and we were fast. Too bad I messed up the leg. That was dumb. The ceiling kept dropping through the Hudson River Valley. We had the terrain feature on the MX20 to guide us through untill the valley opened up and we flew the last 20 miles in to Saratoga Springs. We blew through the timing line and continued on. We had to climb to clear the mountain peak at 3,200' only the cloud deck remained at 3,000. There were holes, but we did not want to chance it - some teams did. Could they get down VFR on the other end? We diverted south and snaked our way through the mountains remaining just over the 500' AGL zone above the grounds below. We were too busy to look at our speed as our eyes remained in a constant scan through the haze and back to the terrain on the MX20. We made it through without a hitch, but we have diverted quite a bit. This has not been our best scoring day, we think; but we do not know what has happened with the other teams. The scenery is beautiful. We enjoy this leg. We tune the radio in to hear the Mansfield traffic and it crackles with racer after racer sprinting for the finish line. We make our final dive bombing run. The winds are a bit lighter and we only cross at 170 kts. A slow crossing but Wild Mama looked great. She ran well and performed at her best. We made it to the finish! The exhilaration of completing the race was overwhelming! The afternoon was our melt-down gathering where we finally get to see our fellow racers with their race faces off. We find that one team - Classic 36 could not make the finish as they got caught behind the storms; and 2 teams were disqualified for having to file IFR to get through the clouds. But all are safe and sound. After the melt-down local host families gathered teams for a night out. Our families, Steve & Linda and Steve & Pat, had Classic 10 and 11 over for a back yard BBQ featuring steak, pork, chicken, homemade crab cakes, homemade salad and dressing, corn on the cob, pasta salad and homemade rum cake and pies. We were stuffed and soooo happy to have a good home cooked meal. The day was really perfect after all. The race was good; we are safe; we meet Mike and Vern at the terminus and become real people; and Wild Mama is transformed from the "Lean, Mean Racing Machine" back into the "Sunday Sedan" ready for her next adventure. Family Fun Day: It was so nice not to have to wake up and run to the Weather Channel to see how long we would be sitting and waiting for a break in the weather. It was nice to stroll down to the dining room at the hotel and take the time to taste breakfast instead of stuffing a donut in our mouths and washing it down with a hurriedly poured cup of coffee. It was nice to take a break. On the other hand, we missed the excitement of dashing off to the airport and departing for our adventure; we missed the excitement of the fly-bys; we missed the daily commiseration with our fellow pilots. Today was a day of reflection and score sheet signing. Theresa did a great job on the score keeping; being off by only 2 or 3 seconds on the legs. It was unfortunate that we had a couple of bad legs as our other times were really not too bad. Remember to do a "dummy check" the next time. Lessons learned. Mansfield put on a family fun day at the airport with vendors, warbird and antique car displays, music and lots of food. It was an opportunity for our hosts to "meet the racers". The towns people were warm, friendly and overwhelmingly welcoming to us all. They asked for our autographs and we all felt quite special to be part of their celebration of aviation. Dinner was a traditional New England seafood boil - lobster, clams, fish, potaotes and corn followed by a giant cake commemorating the race. The evening of dancing under the stars clouds was lots of fun. We all lined up for the Electric Slide and danced to the twist. Our racing event is coming to an end with the debriefing and awards banquet tomorrow; then we are released to go home on Monday morning. Wild Mama will continue north to Maine and Theresa, Mike and Buttercup will head back to Oklahoma. We will go back to being our old selves, but changed by our experience. We are already looking forward to another race year. Classic 27 took the honors of first place this year. Team Wild Mama finished without any assessed penaltied - none were needed because of the fuel cap mistake that cost us probably many places in the standings to bring us to our 26th place finish. The experience was incredible and Theresa and I had a blast. We learned lots about aviation and aviating and look forward to sharing the cockpit for another race. We are looking together toward 2011. I am looking forward, myself, to 2009. HOMEWARD BOUND ...Well, kind-of: (TERRY) Not so bright and not so early Monday morning all of the racers are released to begin their respective journies home. Team Wild Mama was no exception there; but we have elected to continue our journies elsewhere. Theresa and Mike departed VFR in Buttercut to see Niagara Falls; and Vern and I headed to Maine for our sea plane ratings in Twitchell's. (Thank you Nicole!!!) 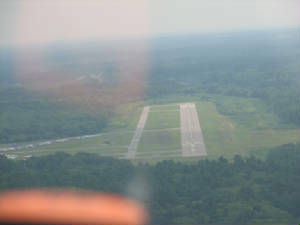 We filed IFR ... just because we could... and got some beautiful shots of Fenway Park and the Boston area along the way. Our first lesson was this afternoon. What a blast. We are being trained in a 172 - easy enough to fly; but what a difference a pair of floats makes! 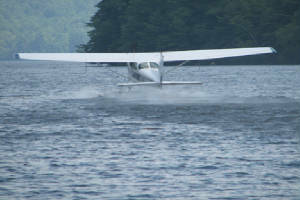 The response of the aircraft off the water is somewhat better than Rob's Saratoga on a hot day; but not by too much. 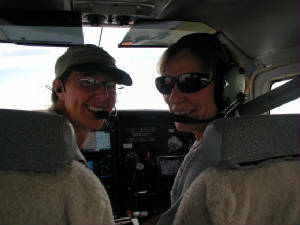 With Vern and Dale (the instructor) in the plane, the Saratoga could actually out-climb the float plane. The yoke is quite heavy for a 172 and the rudders are surprisingly responsive. There are a few little nuiances - like pull up the water rudduers before departing; and the airspeed is quite critical upon landing as the extra drag caused by the floats turns this sleek, mild trainer into a mini-baby grand piano. Vern and I each flew for an hour this afternoon doing short water landings, rough water landings and takeoffs and a variety of get acquainted manuvers. Early tomorrow morning we will do glassy water training. So far, the landing part is not as difficult as I imagined. There is a small "plop" which is cushioned with a bit of power but the water is bumpy to glide across. Still and all, the "plops" have been much softer than some that I have made with Wild Mama. The scenery here in Mains is breath-taking with the lakes, rivers and lush, green hilly terrain. We are looking forward to some water-hopping excursions during our lessons; but just being on the water with the plane is quite enchanting and very special. I guess the search for floats for Wild Child might have to intensify. This begins part 2 of our adventure. As fuel is so high, we are electing not to make the annual mecca out west and, instead, meander our way home after the float plane training, with the emphasis on meander. We have some plans, but let's just see where the winds blow Wild Mama. (THERESA) We departed Mansfield and retraced the last 1/.2 of the last leg of the race over Pittsfield then kept on motoring. We had a headwind and a fairly ow ceiling but the visibility was much better than the race viz. We flew over the finger lakes area and stopped in a beautiful little airport named Hamilton nestled in a valley; then on to Niagara. This was the first time seeing the Falls. There were still scattered clouds and bumps either from the terrain, clouds or both. We got permission to overfly the falls but there was patchy rain and a low ceiling. We could not get there to see the falls and remain out of the clouds. While at Niagara we sat through a bit of rain. We had the most wonderful taxi experience. Noorahmad, our driver, has a mini-van with lovely, soft gentle piano music in the background. He gave us a bunch of are information and took us to the restaurant overlooking the falls that he said was one of the best. It was excellent – out on the 2d floor patio overlooking the falls and all the Canadians on the other side at Horseshoe Falls. It was so cool as it was always seemed a great planning extravaganza to go to the falls; but we have this little airplane and it was as easy as a lunchtime stopover. After departing Niagara International we got advisories to get to Akron, OH, our destination. We headed south and right into some rain showers. We took up a westerly heading over the falls and Lake Erie, we climbed to 3500’ and went right over the falls sneaking into Canadian airspace with the permission of ATC. As we kept going, the rain kept coming and here we are over Lake Erie, water below, clouds above. We lost sight of the shore, in Canada, over the lake but still with flight following. We dropped down to 2000’ – a mere 1400’ over the lake and passed through this archway of clouds that opened just after to expose beautiful blue skies. Again close to Akron, the cloud thickened up to the point that IFR was required – and we did because we could. At Akron-Fulton we saw the huge blimp hanger and the door on either side are 600 tons each. The hangers are steel on the inside and rubber on the outside. We ended with a nacho dinner at Appleby’s in Akron, the end of a very perfect day just motoring around in our private little airplane – so cool, just so cool. 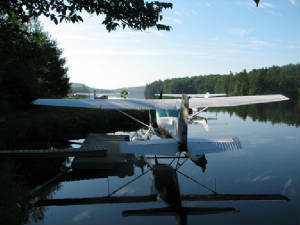 Just Plane Fun: Early this morning we headed to Twitchell's for some glassy water training. The air was still, the water was, well, like glass, and the scenery was quite distracting. We leap-frogged from site to site, skimming across the top of the river to the most gentle of landings ever. I could hear 'ole Ed Wilson hollering "hold it off, hold it off!" With the stall horn wailing, the aircraft settled gently on to the glassy top below us; then up again for another go. We would climb only to about 800' MSL - maybe 600'AGL and skim the tree tops only to drop down in another cove. We completed step taxiing which is a high speed taxi much like a boat wuld run up on a plane in the water, as opposed to begin fully settled in the water using the water rudders. Finally, we did some air work - stalls, slow flight and steep turns. My instructor, Tom, also showed me beaching, docking, sailing, different taxiing techniques and a whole host of other things not required for the check ride, but necessary to venture out on our own in a float plane. This is way fun. Most of the time, though, was spent just barely above the treetops setting up to glide right in. This is learning and this is work; but it hardly seems like it. Our check rides are scheduled for tomorrow; so if all goes well, this will be our temporary farewell to Twitchell's. Again tonight, we try to catch up on some much needed sleep. THERESA'S LAST LEG HOME: After spending the night in Akron, Ohio, which we nicknamed Pleasantville because everyone we encountered was so happy and nice, we departed Akron-Fulton Airport at 8am into cool, still air for a pleasant hour or so ride over to Auburn, Indiana--Mike's original home and where his family still lives. It's also the home of Lara Zook Gaerte, our rivel for last place in the race. 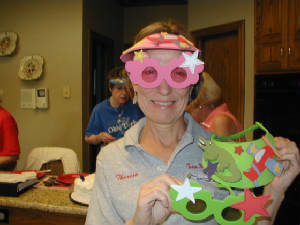 (Lara and her partner, Jan, won the turtle, which is adorable and sits on the counter at the FBO that Lara runs!) On the way to Auburn we diviated north to fly over Cedar Point, home of the amusement park with the most roller coasters in the world--and the highest too, I think. Cedar Point is an island-like piece of land that juts out into Lake Erie. 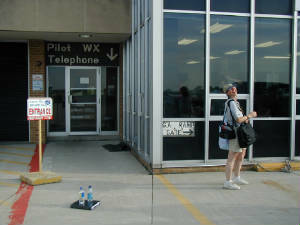 We looped around for a quick look, avoiding the traffic at the busy Sandusky Airport. Our excursion over Lake Erie wasn't quite as "eerie" today as it was yesterday. It was sunny and bright today--no rain or lowering ceilings. Check Rides Passed: We bounded out of bed this morning to catch a quick early morning flight before our 10 a.m. scheduled check rides. Tom had taught me so much yesterday and I just wanted a quick review and a little docking practice as we had not done too much. I threw back the curtains to disclose … dense fog blanketing the area. I felt as if I were back on the race days … wait and hurry up. Knowing we had a bit of time, we sauntered into Tim Horton Coffee shop for a breakfast of “Fruit Explosion” muffins and good Tim Horton coffee – a real treat as it is not available back in Florida – then off to Twitchell’s. We had time to complete the paperwork, pre-flight the planes and get a little quick docking practice in before the examiner arrived. We were ready to go. I went first – just so I could say that I had my rating before Vern! We had the perfect condition for the glassy water: there was not a whisper of wind; there was still a light haze and a few clouds even though the main fog had already burned off creating a perfect mirror image of the shoreline along the river. We completed the necessary air work and looked for some ruffled waters – none to be found so we did glassy landings, step taxiing and other water work required for the ride. “Head back in and get Vern,” the examiner, Guy, commented. Yes! I passed! In short order, Vern did the same. With our newly wet licenses in hand, we opted to head off to a white water rafting adventure in Gadabout Gaddis, Bingham, ME. We grabbed a quick lunch and headed off to the north-ish after a brief excursion over the river where we had been flying the float planes. I could non resist the temptation to photograph the area, although we were not able to drop down below the tree line and get the Albatross view we had seen from the float plane. The low foot hills, meandering rivers and hillside speckled with lakes was, nonetheless, beautiful. We picked up the Kennebac River at KOWK and followed it as it snaked its was northward. We were to look for the log cabins between the 2 dams. 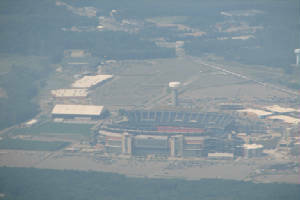 Good thing we had landmarks as the runway was not easy to spot. It looked more like a well manicured pasture than a runway. We had tentatively identified it until Vern made a positive ID on the wind sock… a dead giveaway. We winds were light and we were advised that it was best to land to the southeast as you could use the river and low tree line to se up a good approach. 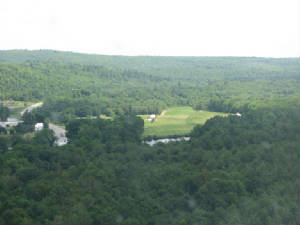 A landing to the northwest would necessitate a steep descent over the hilltop and tall trees. We dropped in without any problems, tied down across from out log cabin and checked. The cabin is a quaint little cabin, one of 6 in a row that sleeps 24! We had plenty of room to spread our wings. Today we catch up on work and rest – a battle we have been losing to date. We catch the rafting trip tomorrow on the Kennebac River at 8:30 a.m. for the full day. We will sleep well tomorrow. Wild Ride: Morning comes early in Maine. Come to think of it, night took a long time to get here too. I am not quite sure what time night darkness fell last night; but I know that I was already in bed by then and sleep was not far behind it. I slept like the dead last night and finally felt, this morning as if I started to catch up on the sleep deficit that I had accumulated over the course of the last 2 weeks. The fog was very dense along the river and we could barely see Wild Mama a mere 300’ away. The morning was still and quiet; birds rustled in the trees; the air was cool. I was not too interested in breakfast but the coffee in the main building was good and hot – just what I needed. The ride to the river on a an old school bus was s bit reminiscent of grade school days although we did not fit in the seats nearly as well. In short order we were dragging our 8 man rafts down to the Kennebec River at the base of a dam owned by Florida Power & Light! We were told that the water was fairly warm – 60 degrees. Nonetheless, I got a wet suit and was looking my usual Nanook-ish. The rapids at the top part of the river were grade II-IV. . . nothing particularly hairy although I could see where they would be if the dam had a high release. This day, the release was moderate which made for nothing more than a really fun time. We were soaked in no time at all, paddling hard to maintain our line as we glides through the sloshing rapids, then all too soon the rapids ended and we had a nice gently glide through the rushing waters. Near the end of our trip we stopped for a steak and chicken lunch along side of the river and the rains came. It poured. Vern and I huddled near the camp fire with some of the other rafters while others ran for the cover of the canopy over the serving tables. As long as my cookie stayed dry, I was not leaving the fire for nothing. When lunch was over, we tumbled back into our rafts for the remaining 30 minutes on the river. The rains came back with a vengeance and we were really soaked beyond belief – even more so than we had been going through the rapids. It was quite cool with no sun so it wa a relief to get back to the bus for the ride back to the cabins. By the time we got back, the sun was out, looking as if no rain fell on the runway area at all. Dinner was fresh lobster soup with what looks to be half of a lobster protruding from the top of the cup. Really delicious! Time to flight plan and check weather for tomorrow. We want to do a little aerial reconnaissance before heading to Bar Harbor in the morning. 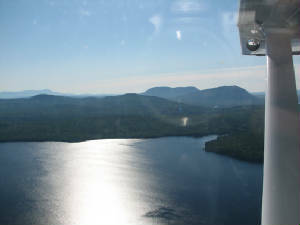 We would hate to lose the opportunity to flight see over northern Maine as long as we are here and the weather is favorable. Lobster up! A glorious morning it was for our departure out of Bingham this morning. The sky was brilliant blue, the fog which had blanketed the area yesterday morning was nowhere to be found and the air was crisp and cool beckoning Wild Mama to fly. We packed and enthusiastically departed around 7: a.m., much to the chagrin of the campers on the departure end of the runway. I am sure they did not expect a roaring engine for their wake-up call. We turned out quickly over the river to use what God gave us to keep as much distance between us and the ground as possible and to enjoy as much as the scenery as possible. 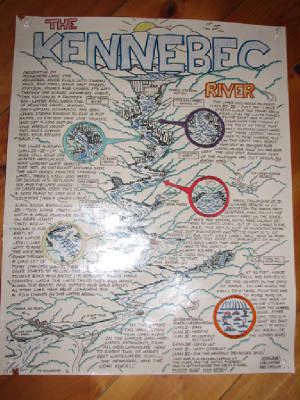 We climbed out over the Kennebec River that we had rafted on the day before. The guide explained to us that the white water was dependent on the released of water for the hydro-electric plant. It was hard to imagine that the raging river of yesterday was, in some places, a trickle around a few well placed sand bars. We continued on up the river to the north past the Indian Pond Dam and on into Moosehead Lake. We passed the funky rock formation with the hotel perched prominently out on a point in the lake, sheltering it from all but those with access by boat or float plane. 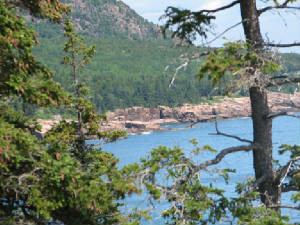 We continued on northward between Baker and Spencer Mountains then turned back toward the south to Bar Harbor. Our 20 minute “direct to” path was a 1-1/2 hour journey through a remote wilderness resembling a low mini-Alaska. Our arrival in Bar Harbor found us being greeted by a friendly and quite efficient linesman who ushered us to our tie down and our rental car in no time at all. We arrived in time to catch the end of the July 4th parade in town and followed behind the throngs of people to get to the seafood festival at the ball field on the far end of town. 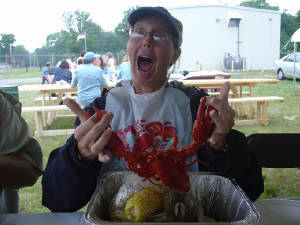 While there, we met our friends, Chuck & Suzanne Nickerson from LaBelle and we all enjoyed the lobster races, fresh Maine lobster and some local sites and shopping before retiring to our respective hotels to catch up on some rest before the late night fireworks display on the harbor. We finished the evening with dinner of Lobster Mac & Cheese and the local fireworks show. The show was great and we even had a blast stuck in the crush of people leving the show. As we got to the car, waiting in line, a local lady told us a lesser known short cut out of the town. While the traffic on our intended route stood motionless, we darted through the back streets and were back to the hotel in less than 5 minutes. Thank you Ms. Local! 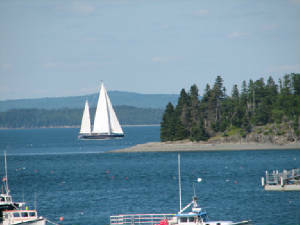 Acadia National Park: Blue skies and light winds greeted us this morning as we set off for Acadia National Park in Bar Harbor, ME. After our hearty breakfast of blueberry pancakes at Two Cats Restaurant and Inn, we meandered down the Park Loop Road to enjoy the tranquility of Acadia National Park. 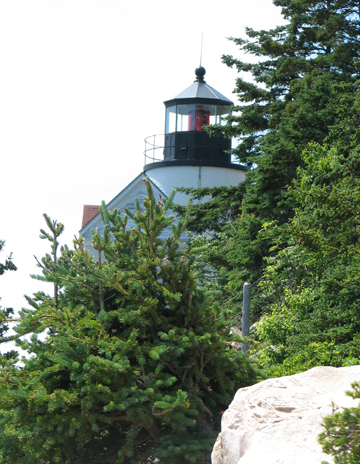 The Park covers 2/5th of Mount Desert Island encompassing 46 square miles and sports breathtaking ocean views along the cragy shoreline, lush green forests and 120 miles of hiking trails up and along some 20 mountain peaks, the tallest being Cadillac Mountain at 1,530 feet to the summit. After leaving the Park, we stopped at Lighthouse Restaurant at Seal Cove for some more seafood, hating to pass up one of our last opportunities before leaving Maine tomorrow. Both the crab melt and the lobster soup were very tasty but I could not convince Vern to go for the fresh strawberry short cake made with biscuits as it is prepared here in the north. He is too accustomed to the southern style using pound cake or angel food cake. Personally, those sweet biscuits are preferred. All the time in Maine and we had not yet seen a lighthouse up close. We caught a long distance glimpse of Egg Rock Lighthouse out in the harbor from the Champlain Mountain overlook; but Bass Harbor Head Lighthouse was an easy drive along the coast, just past the park. This is a still working lighthouse and Homeland Security has its restrictions so we could not go inside; but it was quite quaint, perched atop the rocks at the edge of Bass Harbor. We curried off to the airport to be greeted by the local version of "don't leave": a dense fog was blanketing the airport right down to the ground level. Low-tech weather method said below minimums to depart. After an hour or so of airplane preparation car rental return and time-killing, we had the required minimums to leave. The fog layer was only 200-300' thick; but the density made it impossible to see anything but the tops of the mountains protruding through the white fluffy sea. 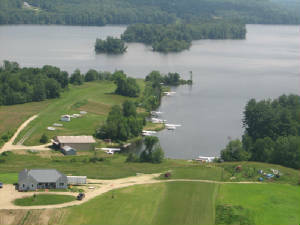 We had hoped to be able to cancel IFR; but the conditions were quite persistent and necessitated our shooting the approach at 2G9 Sommerset, PA. A quick turn around for fuel ad lunch and we were back off into the soup; but at a much higher level. The whole day we managed to remain on the northern side of a nasty line of storms that ran the eastern coast. only bumping into them occasionally. The last lingering build-up was just south of Hazard, KY. We diverted a bit faqrther north, then came around back on course. By the time we hit the Tennessee State line, we could finally cancel IFR and do the last of our flight-seeing. Tennessee is still beautiful and green; but a different kind of pretty than the Maine area. We will remain here in TN for a few days to get the new log cabin put together and ready to rent; then we will head south bound on the last leg of our journey. Homeward Bound: After 3 weeks of funa and adventures, Wild Mama took her last flight of this trip departing in to very grey IFR skies over Sparta, TN. We had spent the last 3 days in Spencer, TN working on the new cabin and getting it ready for rental. It is beautiful and very cozy. Its setting off the highway back in the woods was very tranquil and we enjoyed the wild turkey, butterflies and wide variety of song birds that flittered about the yard. Unfortunately, it was time to go home; the race; vacation; the thrills all behind us after our last leg. There was a long line of thunderstorms stretching from east of Atlants throughout Alabama. The line was not really moving except to fill in and expand. Picking our way through was a challenge. We decided on going east of Atlanta as the storms were spread enough to give us a few holes to penetrate. 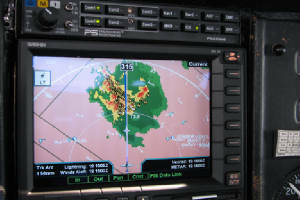 With a 50 mile deviation, we were finally able to get through only to watch hole close and storms strengthen behind us. After a quick fuel stop in Homerville, GA ($4.45 for 100LL) we were back in the air agin on the last leg of the last leg. Our beautiful mountains, rolling hills, meandering rivers and unfamiliar scenery was replaced by the Florida flatlands; cookie cutter houses and I-75. There is some comfort in familiar territory; but it punctuated the fact that our journey was near an end and there was lots of work to be done after 3 weeks away from home. Our homecoming was uneventful... actually, a good thing: no storms, no fanfare, no one around. 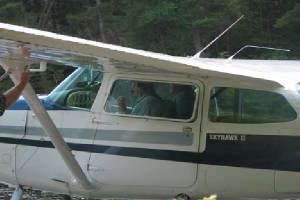 We landed in perfectly calm conditions, taxied Wild Mama to her perch outside of Vern's hanger, unloaded and drove home. A good end to a great adventure. When the dust settled, we will post some reflections of the journey . . . aftr we have the time to relax and reflect. REFLECTIONS: Now that we are all back home and settled in again, we have time to reflect on our journey. As it was last year, it was certainly an accomplishment JUST to have completed the race. We had weather issues and patience was certainly the order of the day on most occasions. We learned the importance of the "dummy check". We learned lots about ourselves as pilots. This year was an incredible year for me - much better than last year. Why? Most of all, it was the other pilots: Last year, I was focused on what was going to happen next. I did not know. Everything was an unknown. This year, I knew the general layout of the procedures; Iknew what to expect in terms of "the race". This year I was able to focus on the racers. 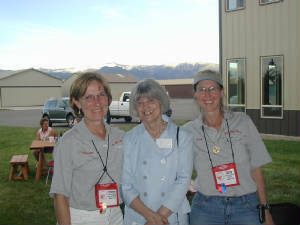 I have the extreme fortune of "meeting" every one of the racers before we got to Bozeman and I had already started to develope relationships with some of the ladies. It was such a thrill to finally meet them all; to put real faces to the names, and not just photos (Karen, your photo really did not do you justice!). 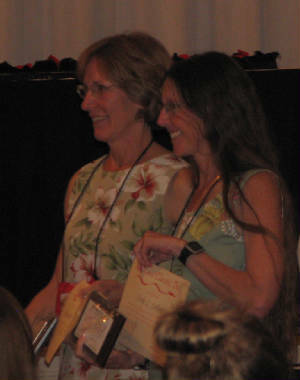 I was able to explore more personalities and mingle in a more relaxed manner ... and Theresa was terrific. From our first meeting we were twins. That made life very easy as she had already though it with me on just about everything. I am already looking forward to 2009 and letting the winds (hopefully tailwinds) blow Team Wild Mama through a new adventure. In the mean time, I have fuel caps to change! 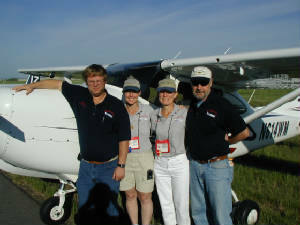 The 2008 Air Race Classic will begin in Bozeman, MT on June 24th and end in Mansfield, MA on June 27th. 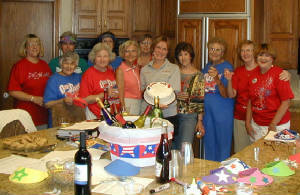 Please join the 2008 Team Wild Mama for our second year in the race. The Presentations above require Power Point. Click here to download Power Point viewer. Please enjoy "See Her Fly" a new song written and performed by ARC racer, Anne Marie Radel.